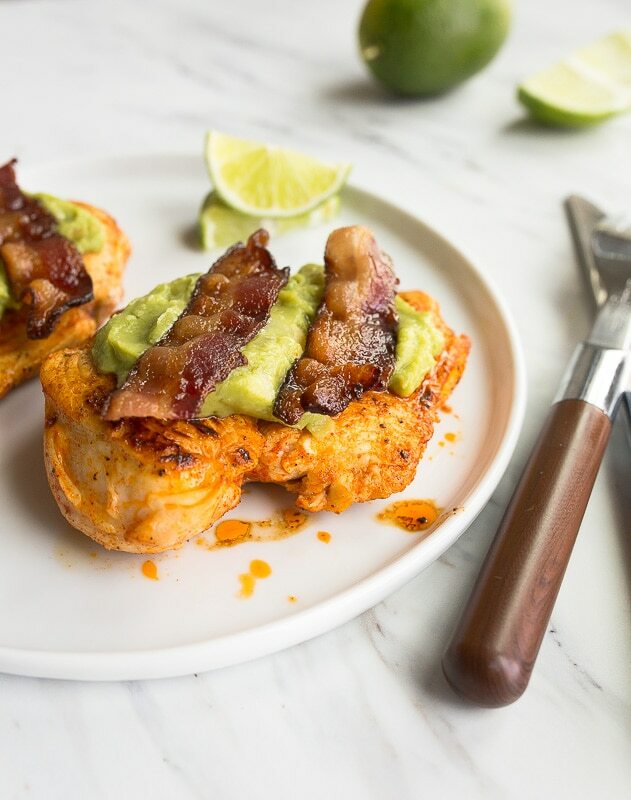 Bacon chicken recipe with guacamole is a hearty Whole30 chicken dinner recipe for your chicken dinner rotation! 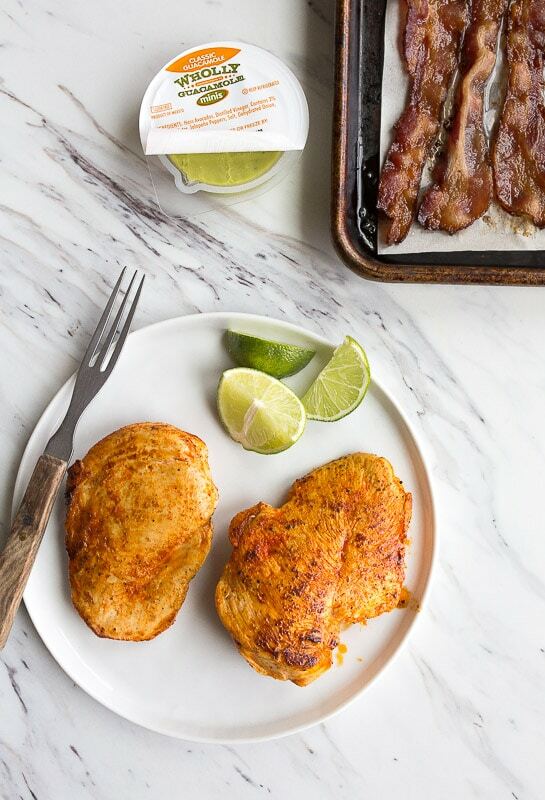 If you’re looking for a way to jazz up ordinary chicken breasts with bacon, you are in the right place! When in doubt, put bacon on it. Wait, is that how it goes? Bacon makes everything better; or something along those lines. When you’re staring at yet another pack of chicken breasts during Whole30, come to me. I rub chicken breasts in a simple marinade, saute them, and then top with a store-bought guacamole and bacon. If your bacon is leftover from that morning’s breakfast, just reheat it gently in a low oven. 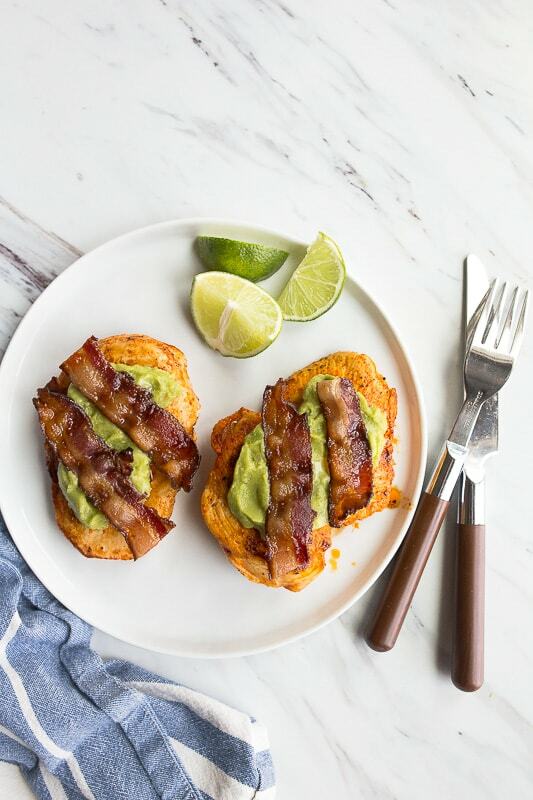 Chicken bacon recipe with guacamole for Whole30. The brand of guacamole that I buy happens to be Whole30 approved. It’s called Wholly Guacamole. I make guacamole frequently (because I’m a Texan after all), but I appreciate help from the store when making Whole30 dinners. I keep plenty of these mini guacamole pouches on hand during the Whole30 month, and love dipping baby carrots or plantain chips into them. It’s a small packet of guacamole, but it’s supremely satisfying, especially if salty snacks are your craving. To be honest, I haven’t missed sugar much on this Whole30 journey. But, I do miss real cream in my tea, and I’d probably bite through my own lip if I saw a bowl of lentils. Or quinoa for that matter. I’m officially at the point where fruit tastes overly sweet, and other foods taste super earthy. Did this happen to you? I’ve been told that getting to the half-way point in Whole30 is a big deal, but I just don’t feel like I deserve any laud. I slipped up a few days ago. I had an extremely stressful experience and cheated with a small piece of carrot cake. If you’re curious, I enrolled in an Improv class to deal with anxiety and help with camera work, and the whole event gave me such terrible anxiety. It was a 3-hour first class where we jumped right into ‘Improv exercises’, and I feel like I’m still recovering from the 3-hour anxiety build up. That night, I had carrot cake in my closet. The next day, I was overly tired and fought the urge to calm myself with food again. I settled for buying tons of exciting flavors of La Croix and other sparkling waters to keep cravings at by. So far, it’s working, because Key Lime La Croix is actually good enough to cure any pie or cake craving. 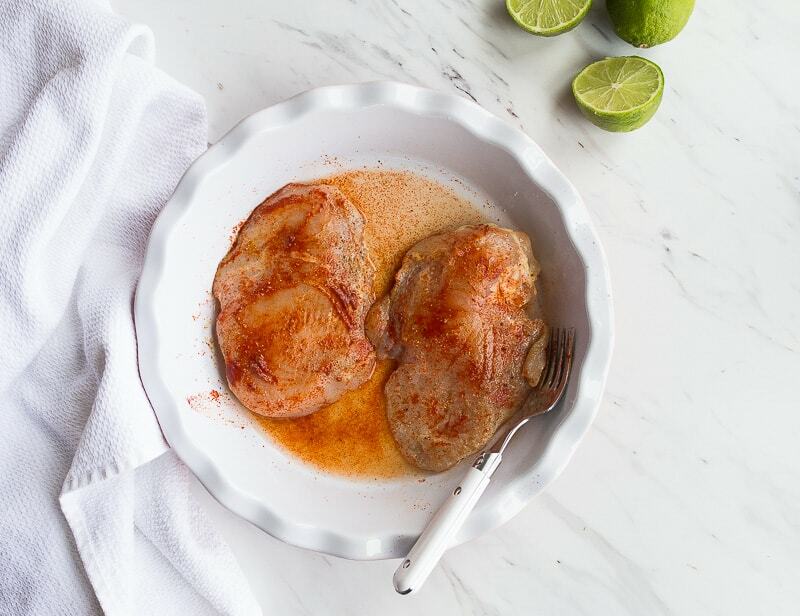 A Whole30 chicken dinner recipe that is actually exciting. I decided the best plan of action was to jump back on the wagon and get excited about Whole30 dinners this week. I put the carrot cake incident behind me, and decided that at least it was homemade. It was my Small Carrot Cake with Caramel Cream Cheese Frosting, and it was so comforting! This chicken marinade definitely gives me the feeling like I’m ordering my favorite burrito bowl at Chipotle. Yes, I have definitely heard that I can order Whole30 compliant food at Chipotle, I actually haven’t done it yet. I fear that eating my beloved burrito bowl without rice and beans would just make me weep in public. Or slip back into a slice of carrot cake, if you know what I mean. So I mimicked the spicy bold marinade on the chicken and topped it with everything else I love: bacon and guacamole. Chicken bacon recipe for the win! If you’re not doing Whole30, feel free to use any type of bacon, but if you are, there are rules. Only a few brands of bacon are truly junk-free and sugar-free. I talked about this in my bacon wrapped asparagus post, but I’m using bacon from Market House this entire month. It’s thick and delicious! I hope this bacon chicken recipe inspires you whether you’re on a diet, or are just looking for a great new chicken dinner recipe! Don’t forget the extra lime wedges for serving! 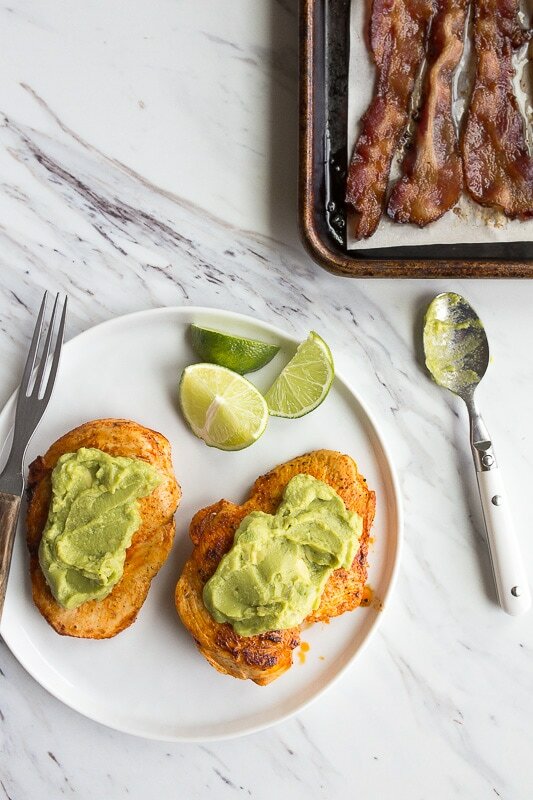 Chipotle spiced chicken breasts with bacon and guacamole. Place the chicken breasts in a shallow dish. Whisk together the tomato paste, cumin, chili powder, garlic, salt, pepper, lime juice and olive oil. Spread this mixture evenly over the chicken, and then place it in the fridge for 15-20 minutes to marinate. Meanwhile, cook the bacon until crispy in a skillet. Drain and set aside. Heat the same skillet over medium heat, and cook the chicken until either side until done, about 7-10 minutes. Use a thermometer to ensure its 165-degrees F in the thickest part before removing from the heat. 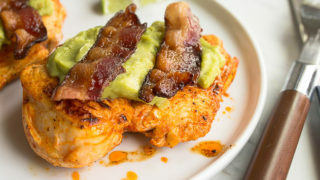 To serve, divide the guacamole between the chicken breasts, top with the bacon and serve. *If you're doing the Whole30 diet, make sure your bacon is sugar-free. **Store-bought Wholly Guacamole is Whole30 approved and totally delicious! It comes in mini packs or a tub. This chicken sounds delicious, I never would have thought to use tomato paste in my marinade. I love the Wholly Guacamole brand for the same reason.I have been using them for lunch lately. Plus they are mini and how couldn’t you. And yes bacon makes everything better :-) Definitely going to give this a try I hope the next class goes better and you don’t have that carrot cake breakdown again. I am rooting for you and your future show on Food Network. They need a dessert/dinner/snacks for two show. Sounds like a plan to me. Maybe on your next book tour if you come to the Northeast. You have been one of my favorite bloggers for years. I’ve done “perfect” whole30s before, but I’m just not feeling it this time, so I’m allowing the occasional moderate wine consumption during the 30 days, and trying my best with the food since not all recipes I develop for work meet the criteria. I miss beans and grains so much and can’t wait to add them back into my diet! I’m so glad you’re listening to your body this time, Deanna. This will probably be my last Whole30, lol. I miss beans and grain a ton, too! Hi. I just found your blog looking for recipes for my IP Mini Ultra. I have been just halving other recipes, but I wanted a recipe for chicken stock that was perfectly scaled. Thank you for posting small batch recipes for the Mini! I didn’t have time to marinade the chicken, it was still frozen (opps). I decided to try something different. I made the marinade as directed. I pulled out my instant pot, grabbed a rack I use in the instant pot, threw in a cup or two of water, put the rack in, put the frozen chicken breasts on the rack, put the marinade on top of the chicken, due to the tomato paste, it was sticky enough to stay on the chicken (even frozen!! ), popped the lid on and set it for 12 minutes on manual, high pressure. I did manual release after about 10 minutes. Most of the marinade stayed on the chicken during the cooking process. I made the rest of the recipe as directed. My husband declared it “Top 10” chicken meals, another instant pot win. Can I marinate this over night?